device as soon as I could and was eager to start transitioning basic Google searches to voice commands. However, one of the annoying parts of using the Google Home at night is the brightness of the LED lights and the volume level of the voice response. 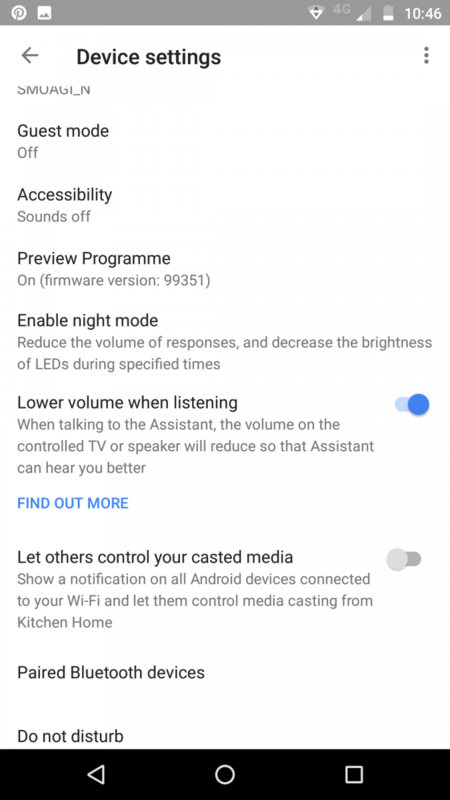 Thankfully, a new update is being rolled out to the Google Home app that adds a new Night Mode feature. The feature allows for the Google home to be used with a decreased LED brightness as well as reduced volume for the voice responses. As you can see from the provided screenshots, we first need to toggle this feature on and then we can configure it. 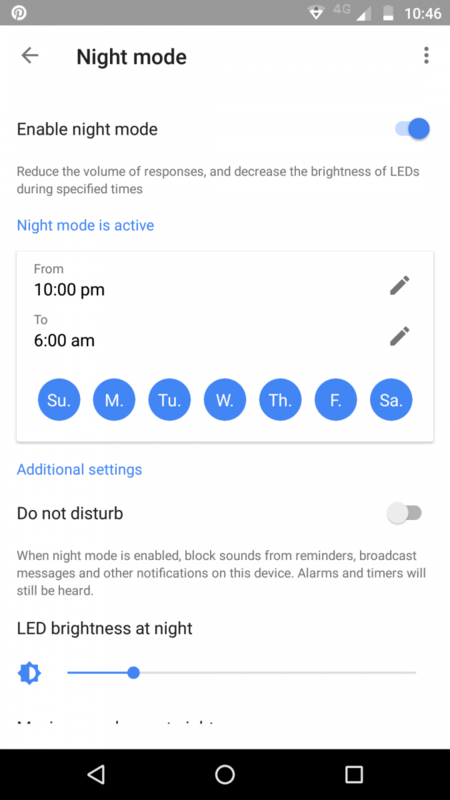 The software lets you specify when Night Mode is enabled and when it will turn off, and you can also select which days you want this to happen on. Since people go to bed at different hours of the day, it benefits Google to include this schedule into the software. There’s a slider for those who want to manually adjust the LED brightness level, and you can also turn on Do Not Disturb mode that will block sounds from reminders, broadcast messages, and other notifications from Google Home. Even if Do Not Disturb mode is enabled, alarms and timers will still be heard. Night Mode has been found by several users in the most recent update of the preview program, which was quietly introduced not too long ago. Reddit user mgf909 found this feature in firmware update version 99351, but others are also on this version and do not have it yet. So it is either an A/B test feature or likely just a gradual rollout that Google is doing via a server-side update in preparation for tomorrow’s event.